Read a full Rule summary right here! This page is full of spoilers, so beware! 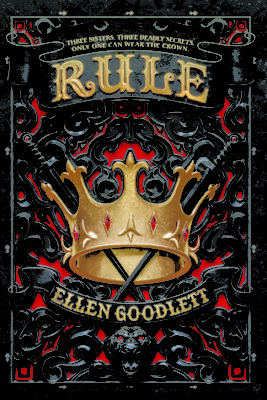 If you’re looking for a review of Rule, we have that, too! If you need a refresher on what happened in Rule, then you are in the right place! Zofi has been on the run with her mother for two months after committing a crime. One night, men storm their encampment. Zofi cuts a hole in the back of the tent and then slits her arm with her knife. She’s going to call on the Blood Arts to use speed to escape. Zofi flashes off across the desert before her blood tithe runs out on top of a dune. A Talon soldier is waiting there for her; it was a trap. She pulls a knife to stab him but feels a prick in her chest. Another nearby Talon hit her with a poisoned dart. Zofi wakes up three days later in a carriage nearly to Kolonya City, the capitol of the strongest kingdom in the Reaches. They let her ride atop a horse, but she draws mirthful stares from everyone in the city. They see Travelers like her as the enemy. Zofi argues with her captors about whether the other kingdoms in the Reaches like to be lorded over by Kolonya. The Talons argue that Kolonya has kept them safe from Genal for hundreds of years. Zofi argues citizens from the Outer Reaches have done so. The Talons soon tell her King Andros has sent for her. Zofi is quite confused. Akeylah is a Cinderella of sorts for her family. She’s the youngest of four siblings; her mother died in childbirth having her. Not even the tithes could save her. Akeylah recently found just the right herbs to use the Vulgar Arts on her father. Akeylah has an odd scar on her upper thigh created when she performed this dark version of the Blood Arts: to tap into her father’s blood to poison him from the inside out. She has to keep the scar hidden at all costs because it’s treasonous to perform the Vulgar Arts. But he hasn’t yet succumbed to the affliction. Talon soldiers arrive at Akeylah’s house to extend her an invitation from King Andros. She accepts it. They tell her to dress for court and call her a lady. It’s technically true because of their family heritage, but no one ever calls her that. Florencia (Ren) is a lady’s maid to the noble Sarella. Ren’s smart and savvy. She’s even had a clandestine relationship with Danton, a young ambassador Sarella was also interested in. Sarella tells Ren he’s headed back home to them. Ren recalls the horrible secret Danton knows about her. A squire comes to summon Ren to the great hall upstairs. It’s a highly unusual request for a servant like her. Akeylah makes it to Kolonya City. She chooses an old dress of her mother’s to wear when she’s brought before King Andros. Two other girls have been invited as well. The king tells them unbelievable news: All three are his daughters. He’s ailing and won’t live much longer. Since Nicolen, his only son (aka the Silver Prince), died recently, he wants to ensure an heir of his bloodline inherits the throne. He brought them to court to train and observe them in the coming weeks. The most worthy, competent girl will be chosen to succeed him. Akeylah suddenly understands why the curse she made hasn’t killed her father. He wasn’t her flesh. The king is. She feels awful the curse she made is affecting her sovereign instead of the man who’s treated her so cruelly. The king tells the girls they’ll soon participate in the Blood Ceremony to confirm they are his daughters and reveal this fact to the kingdom. They’re to tell no one why they’re here until after the ceremony. Zofi goes to the stables to steal a horse and escape. She chooses the most beautiful one, a silver stallion. She wants to question her mother—the only person she trusts to answer her questions—in person about the king’s claims. Vidal, one of the Talons who brought Zofi to Kolonya City, stops her. He says she’s free to leave, but she’s not free to steal his friend’s horse. It has sentimental value to Vidal because it belonged to the Silver Prince. Zofi‘s mind flashes back to when her friend Elex was accused of cheating in cards by a Talon. Zofi ended up doing a strength tithe and killing the accuser when he followed Elex to attack him. Elex panicked because it was the Silver Prince she’d just killed. He took the fall for her crime. Zofi feels the guilt over the prince’s death all over again. Vidal mentions how running (as the Travelers often do) insinuates guilt. Zofi decides to stay. Ren goes to her mother to get to the bottom of the king’s claims. She wants to know why her mother raised her as a servant if she’s truly the king’s daughter. Her mother says it was for her safety and so she could learn the value of hard work. Many of the life lessons she’s learned about herself and the nobility could’ve never been learned by a pampered princess. Danton arrives. Ren can’t tell whether he knows about the king’s revelation. Her mind floats back to their secret times spent together in that cave, especially the time he asked for that favor. Danton needed access to the king’s papers to determine when and where the fleet headed to Davenforth planned to anchor. Danton said many innocent lives will be saved if he could pinpoint this information because the soldiers were under order to ransack the town and kill the rebels there. He wanted to smuggle everyone out of town before the soldiers arrived. Ren helped him gain access. He took the information and left before dawn without saying goodbye. Instead of helping the Davenforth villagers, Danton and his party killed 1,854 Kolonyan soldiers who’d been there to keep the peace. Danton had lied about their purpose in Davenforth. And she was party to the deaths at Burnt Bay. Akeylah watches the king the night of the Blood Ceremony feast. He’s still able to hide his illness from everyone but those closest to him. But he’s weak and barely eats. She feels guilty for cursing him unintentionally. Akeylah meets a young woman who challenges her to not try to fit in. She should play up her foreign attributes. She introduces herself as Rozalind. Akeylah reveals a little too much about her family, hinting that her home was not a happy one. Then it’s time to hear the king’s announcement. The other two sisters are already assembled by the king. Whenever she looks past the king as he begins his announcement, she realizes who Rozalind truly is she is: the king’s new wife, the queen of Kolonya. Zofi’s surprised when she hears a note of uncertainty in the king’s speech as far as Kolonya’s united power with the Outer Reaches. As she thinks about it, she realizes many things have changed after the death of the prince and the massacre at Burnt Bay. Zofi doesn’t care much about this until she remembers she might be the one trying to rule this mess someday soon. The king calls for the Blood Ceremony to begin once he finishes his speech. He asks Zofi to step up first. When her blood mixes with his in the bowl the acolyte is holding, it lights up bright white, signifying their relation. The same thing happens for both Ren and Akeylah. They are proven to be his daughters in front of the whole court. The sisters quietly argue about whether this is a good lot in life. Ren is the most excited about it, and Zofi is the least. But then Zofi begins to think about how she could help her people, the Travelers, if she was queen. The Countess Yasmin, the king’s sister, comes up and hear the girls’ arguments. She says she’ll be surprised if any of them end up having what it takes. Someone was in Zofi’s room while she was gone. The words “Blood-Killer” are written on the headboard of the bed in silver paint. She breaks it down and burns it in the fireplace to destroy the evidence. The color of the paint might indicate someone knows she killed the Silver Prince. This is quote is from a nursery rhyme about avoiding tainting family blood. It is a song in Tarik dialect, a banned language originating in the east. The word “rye” means king, and “dottir” means daughter. Whoever wrote this message must know she’s cursed the king. Ren is the only sister enjoying the evening and using the ball as an opportunity to gain traction in her quest for the crown. Danton cuts in as she’s beginning to dance with another man. Ren hates how his touch and voice still effect her. He says she doesn’t know the full story of what happened. She won’t listen to him. Ren receives a note from Danton asking her to meet at their old spot. When she gets to the cave, Danton’s nowhere to be seen. There’s only the number 1,854 written on the wall in odd-smelling black ink. This isn’t Danton’s style. Someone else knows what she did. Akeylah has a nightmare about the rhyme written in red. Her siblings and the queen tease her with the saying in the dream. When she wakes, a bird brings her a scroll from the king. He requests she meet him at the training field after breakfast. Akeylah goes to the practice fields. She and her sisters observe how Talon soldiers are trained. It’s brutal at times, but the king explains it’s necessary. The Outer Reaches are the shields for Kolonya, but the Talons are the blades against their enemies. He questions his daughters on how each feel about this and about the limited information given to the Outer Reaches. The sisters are then amazed to see a young Talon use the Blood Arts twice in a row, when he should’ve already been spent from his first tithe. The king explains that with practice, the Blood Arts can be used longer and combined with other wielders nearby. They had no idea. The king describes Blood Arts the girls were not familiar with. One such tithe is camouflaging yourself. Yasmin demonstrates this. Zofi wants to give it a try. She ends up in a battle with three Talon soldiers. She takes the first and second ones out. The third one is a better fighter and a face she knows well: Vidal. Zofi uses her secret vials of blood to boost her powers to gain the upper hand against him. She’s distracted for just a second by a flash of a man using the Blood Arts for speed. No one else seems to notice him. Because she’s distracted, Vidal defeats her. He quickly jumps to Zofi’s defense when another soldier mocks her background as a Traveler. The king commends Vidal for the win and for the wise words defending Zofi. She can’t decide what the strange ache in her chest is when she thinks about what Vidal did for her. Ren and Akeylah worry whether they’ll be called on to fight after Zofi volunteered to. Ren also wonders what else she doesn’t know about Zofi after witnessing her savvy Blood Arts and fighting skills. Could Zofi be the one who painted the ominous note in the cave? When Ren and Aleylah leave the fields, Danton is waiting for them. Akeylah calls him by name because he stayed at her father’s house not long ago. Danton says he doesn’t remember her, but now Ren is suspicious of this sister as well. Ren accuses Danton of lying to her about the information she gave him that resulted in the deaths. He says he didn’t ever intend for that to happen. He seems genuine. But Ren knows he can be a convincing liar. She tries to catch him off guard by abruptly mentioning the number written on the wall in the cave. He’s surprised. Ren’s confused once again. He still seems to care about her. Ren goes to the baths to clear her head. Zofi’s there, too. Danton’s saying about family either strengthening or killing you runs through her head unbidden. She decides to try to learn something from Zofi today, too. Zofi can tell her sister wants something. She tries to decipher their conversation and decide whether her sister wrote the words on her bed. Zofi almost likes Ren. But she hates these court politics. She’d rather meet a fight head on than have to figure out who is toying with her. While lying in bed that night, Zofi sees a shadow in the corner. She thinks of the flash of a man she saw on the training field and pulls the knife from her pillow. Then she hears a voice she’d know anywhere call out her name. Akeylah researches the Vulgar Arts in the library to try to discover how to undo the curse on the king. Rozalind appears and flirts with her. She asks why Akeylah is researching this topic. She acts like it’s because she’s intrigued by what she saw on the practice field yesterday. Akeylah’s surprised to discover that in Genal the most capable sibling rises to become ruler, not just the firstborn. She’s also surprised that Rozalind chose this marriage to secure the alliance between Genal and Kolonya. Ren and Akeylah are at a royal meal and wonder where Zofi is. They’ve heard her room is locked from the inside. Sarella pesters Ren, so Ren claims the king had the sisters raised in modest surroundings to build the skills they would need to rule. She’s shocked when Akeylah goes along with her story and affirms the lie. The king enters and tells the girls he would like to host another training session tomorrow. Ren calls her friend Audrina to her room to ask a big favor. She wants the girl to try to switch with Sarella’s new maid to be the one who helps her. She needs to get some information out of Sarella. Elex was the intruder Zofi noticed in her room last night. They’ve been holed up in her room all day. Elex tries to convince Zofi to run away with him. He’s afraid she’s going to be harmed if her crime is ever discovered. She thinks staying to try to become ruler is the best way to help their people. Neither will change their mind, so Elex leaves. They have a moment before he drops out of the window. Zofi whispers that she loves him after he’s gone. Zofi hears a scuffle and sees that Elex captured by Talons. Vidal is nearby and tells Zofi they just caught the man who killed the Silver Prince. Akeylah’s shocked when Ren thanks her for standing up for her earlier. Someone brings Elex’s crime up at dinner. King Andros says to prepare the gallows for him. Akeylah tells Rozalind she’s confused about why the boy won’t defend himself. Akeylah thinks there’s something else going on. She wonders whether he’s her blackmailer. She hates that she’s suspicious of everyone around her, even Rozalind; it’s getting old. Zofi asks Ren where the entrance to the dungeons is. She explains that Elex is a friend and is innocent. She needs to free him. Ren agrees to share the information when Zofi says she will do any favor Ren wants at any time with no questions asked as a thank you. Ren takes her to the secret servant’s entrance to the dungeons and tells Zofi the series of knocks necessary to get past each checkpoint. Zofi gets to Elex (with a couple of skirmishes along the way) and rescues him. As they’re escaping, Vidal stops them. Zofi pleads with him to let Elex go. She says she’ll tell him the truth through a Blood Oath, in which she cannot lie. Vidal agrees to this against his better judgment. After she tithes, Zofi reveals that Elex did not kill the Silver Prince and that she did. When Vidal asks why she killed him, Zofi reveals the prince attacked Elex. Vidal asks why. Zofi says because they were Travelers. Vidal knows this has to be the truth since she’s under the Blood Oath. He lets them go and even deters the other Talons when they almost intercept Zofi and Elex. Before Elex leaves, he asks Zofi to come with him even though knows her answer before she responds. She has to stay back to get the crown to help the plight of all Travelers. Elex says she must win it. Zofi promises she will. The next morning, Ren receives a threatening message that says she has until the Feast of the Sun’s Glorious Ascendance. Danton arrives to tell her to watch her back. She acts like she doesn’t know what the alarms last night were about. He explains about Elex’s escape. Danton’s afraid he escaped to try to bring down the other heirs. He tells Ren he cares about her and wants to make sure she stays safe and assumes the throne. He wants to help her free his people, the Easterners. Ren says after the trick he pulled on her before, she’ll never trust what he tells her. Ren pulls Zofi out of training to visit with her about this new threat. Zofi asks Ren if it’s the first of its kind. Ren’s reluctant to answer, but Zofi shares that she’s received a threat about something that happened out east. Ren then admits she’s received a prior threat, too. There’s only one person they can think of who stands to profit if neither of them take the throne: Akeylah. Akeylah’s sisters confront her in the library. She shows them the scroll in her pocket to prove to them she’s being threatened, too. They discuss who would benefit if none of them take the throne since the second messages told them to leave town. Any of the Outer Reaches would because in the event of no heir and each area (North, South, East, and West) can send a candidate to compete for the crown. But the messages hint at a more personal connection. It almost sounds like someone who has ownership in the royal line or is close to it. And it’s someone who must know their way around the keep to secretly deliver the notes. They decide to all do research and meet again after their next practice session with the king. The notes have given them a deadline: They have until the feast, which is four days away. During their next training session, the king takes them to the Sky Squats, tall, apartment-like buildings constructed as the city grew and ran out of room. It’s easier to defend within the city wall, so building up instead of out was the solution. The rudimentary nature of the dwellings bothers Ren. They’re headed to the Squats for one of the regular audiences the king has with the working class to stay touch with their needs. They divide the group into three smaller ones by profession: Akeylah is with the king, Zofi is with the queen, and Ren is with Yasmin. Ren and Yasmin’s group is farmers. The first one to come forward talks about the blight on their crops. Yasmin says they’ve known about it for two months and are working on a cure. The farmer says it’s gotten much worse and they’re about to lose their entire crop. Ren promises the king will provide food for the farmer’s family if that happens. Yasmin scolds her. She says they might not even have enough food for the nobles if they can’t get the blight under control. Ren’s appalled by the reaction. It makes her realize the type of ruler she wants to be if she wins the crown. The sisters discuss who the candidates from each Reach would be. Zofi says they should look into each of them to see if they might be a suspect. Zofi hasn’t received her second threat yet, so they wonder if they could monitor the mail as well as the castle to watch for the perpetrator. Ren wonders if Audrina can watch the mail. Zofi will set traps around her room. Zofi goes to Vidal in the stables to thank him for allowing the innocent Elex to escape. He has somewhat of a guilty conscience about it but seems to reluctantly accept her thanks. Then his form shifts into Nicolen’s ghost. He smells like the grave. He tells Zofi she has three days to vacate Kolonya City or the one person who’s still loyal to him will reveal her secret to everyone. Zofi wakes up on the stable floor with a concerned Vidal standing over her. She thinks the vision of Nicolen was her mind playing tricks on her. She tells Vidal she fainted from the heat. Zofi finds her sisters to tell them what just happened. Akeylah says the vision was probably a mental projection, a rare Vulgar Art. The realization hits them all at once: It has to be someone related to her (within four generations) to perform a Vulgar Art on her. The king calls Akeylah to a regional council meeting in the solarium. There’s a representative from each corner of the Reaches there. The only one she recognizes is Danton. The king wants to talk about the grain blight. He’s wanting to purchase crops from one of the Reaches. Not much grain is left. The king says that everyone is going to have to sacrifice, but Danton’s response is it doesn’t look like Kolonya City is sacrificing much with the extravagant feast coming up in a couple of days. Akeylah suggests that they still have the feast but they have less food to show they are cognizant of the hungry in their kingdom. Ren seconds her idea. The king agrees to this plan. Danton then brings up the trade sanctions on the Eastern Reaches. The king says Danton needs to keep his people under control for them to have the same privileges that the other Reaches enjoy. Danton says his people are unruly because they are hungry. The king is not well during the exchanges. He’s coughing a lot. Rozalind catches Akeylah to congratulate her over the stance she took in the meeting. They overhear the king and Yasmin discussing his daughters. She doesn’t think any of them are fit to rule and wants to go with her plan (whatever it is). Akeylah knows Yasmin has all of the qualifications to be their blackmailer. Ren visits her mother in her new, more lavish chambers. They haven’t talked much in the last week. As they’re catching up, her mother mentions how odd Yasmin is. She worked as a maid for her for just a little while years ago. Yasmin would talk to herself, stare off into space, and fall into trances. Ren’s mother’s concerned when she calls the other two girls her sisters. She tells Ren they’re not worthy because of their lineage from their mother’s side. This statement bothers Ren. Ren talks to Audrina next. She hasn’t noticed anything suspicious in her surveillance of Sarella. Audrina acts a little annoyed about the continued request, but she says she‘ll do it. Danton’s been lingering around Ren’s rooms in hopes of finding something that would convince her he’s a good man. She told him actions speak louder than words, after all. He found a young boy lurking nearby with a little glass ornament filled with blood. The boy was paid to bring it and hide it in Ren’s shoe. They’re not sure what it is but can’t help but wonder if it’s something to do with the Vulgar Arts since blood is included. Danton wants to keep the ornament with him since it was supposed to be hidden in Ren’s room. He’s afraid of the power it might have over her. But Ren insists she keep it and says she has a plan. Danton’s frustrated she won’t tell him what the plan is and asks what he can do to make her trust him. Then he kisses her. Even though Ren knows it’s a bad idea, she kisses him back. Rozalind finds Akeylah in the library. She’s been searching for clues about Yasmin since they overheard her tell the king she wanted to pursue her plan to fill the throne again. Rozalind leads Akeylah to the University of the Blood Arts in the Alder Tower. They go to the office of an acolyte. He tells Akeylah a story his mentor handed down to him about Yasmin. The two of them had worked together for a long time when suddenly his mentor took sick. He shared with the acolyte that he’d been poisoned with phantasm venom. He also said he’d been touched by the Vulgar Arts. His mentor told him to look in the book kings love best in the library. He also told him to look for the scar left behind (like all Vulgar Arts do) on Yasmin’s rib cage. Rozalin thanks the acolyte for the information. He thanks her for the information she gave for him. She says to let her know if he needs any other proofs of concept. Akeylah asks Rozalind what information she had to give the acolyte to get this story in return. She pulls her into her chambers and shows her how she can work the Blood Arts even though she’s Genalese. Akeylah is worried that the man has that information. The two kiss. Akeylah leaves in a hurry so her Vulgar Arts scar isn’t revealed. The sisters examine the blood-filled glass ornament. Zofi’s worried that someone else has figured out how to bottle the Blood Arts. If so, the Travelers could lose their advantage of using multiple tithes in a row even after their natural power has expired. Akeylah tells the sisters about the Yasmin revelation. Zofi will spy on Yasmin to see if she has the scar. Zofi sneaks into Yasmin’s room and eventually finds one piece of evidence: a letter from Yasmin to her father saying she should be the ruler instead of her brother. Yasmin makes a sudden return to her room. Zofi quickly tithes to camouflage herself. It almost seems like Yasmin sees her, but then she leaves the room. Zofi tells her sisters about what happened and the letter she found. They compare it to one of their blackmail letters, and the handwriting is the same. The sisters almost feel like it’s too easy, though. Why would Yasmin keep a damning letter like this in her room? So they will go to the feast tonight and look for further evidence. Rozalind is supposed to help them in their mission. Ren and Zofi are a little suspicious of her, but Akeylah says they can trust her. Akeylah asks Rozalind what she’s learned. Ren and Zofi hope no one notices the bond between the two. Lexana, one of the nobles Ren likes the most, comes over to invite Ren to her wedding later in the week. Ren’s shocked to learn her fiancé is Danton. When their eyes meet, Ren can tell everything isn’t as it seems. But she doesn’t care. She’s furious Danton broke her trust again. And she’s mad at herself for giving him a second chance to win her trust. They lure Yasmin to the edge of the gardens to warn her about a (false) plot against the throne. They show her the finger of the deceased acolyte, still adorned with the ring that slowly poisoned him with phantasm venom. Yasmin doesn’t confirm or deny their accusations but simply says she’s only ever worked to protect this kingdom and their family. The girls make her promise to stop the threats against them. They say they’ll keep her secret if she’ll keep each of theirs. Yasmin never affirms that she’s their blackmailer, but she agrees to their terms. The girls return to the ball. Vidal asks Zofi to dance. She fights her attraction to him the whole time out of loyalty to Elex. He tells her he believes her and understands her motives. She asks whether he can believe the things she said outside of the Blood Oath about how Nicolen treated the Travelers. Vidal leans in to kiss her. Then somebody screams. Akeylah thanks Rozalind for exhuming the acolyte’s body to retrieve the finger as they dance. Rozalind says the acolyte took a sample of her blood to trace her lineage since she can perform the Blood Arts. It proved that she’s a full-blood Genalese. Ren asks for a word with Akeylah. She warns her sister that the bond between her and Rozalind is obvious. Rumors start easily and can spread like wildfire. Akeylah says she’ll end it. She dances with Gavin and soon hears a loud scream. Danton tries to corner Ren as she leaves Akeylah’s side, but she won’t have anything to do with him. She goes to her father. He asks if she thinks they did a good job scaling back on the food. She thinks so and is proud. The king says they’ve got enough food for a couple more weeks. Hopefully they’ll have the blight figured out by then. Then King Andros shouts and falls to his knees. There’s a ruckus outside. When Rozalind comes to attend to the king, Ren rushes to find her sisters and see what’s going on. Countess Yasmin is dead by either murder or suicide. Her body lies on the ground down below the balcony. The sisters are held captive at the castle until the day of the funeral. Rumors have been flying about whether Yasmin was killed and what illness the king has. They go to Necropolis, a city within a city, which serves as the burial grounds for the nobility of Kolonya. Tradition says family must inter the one who has died to ensure their proper passage into the afterlife. The king tries to do so but isn’t strong enough. The three sisters step up to do it together instead. Akeylah tells Rozalind they can’t have their dalliances anymore. She doesn’t want to bring criticism to the throne. Rozalind says her marriage is one of convenience for the sake of politics. The king feels the same way. Rozalind dissolves into Akeylah’s adoptive father, ranting at her. He says his deadline didn’t get through her thick skull. He hopes his new message will: Akeylah’s one of his enemies now and better watch out. When she comes back to the present, Rozalind is holding Akeylah’s face and is worried about her. A book of Kolonyan love songs is lying on the floor. It reminds Akeylah how the acolyte told her about something being hidden in the library in the book kings love best. A piece of paper slipped inside the book was written by the acolyte’s master before his passing. It talks about a Vulgar Art that used to be only a Blood Art that he’s trying to decide whether to reinstate as such. The tithe involves mixing blood so two become one. It’s best performed between blood relatives and results in them being able to hear the other’s thoughts and feel the other’s feelings. It explains a lot about Yasmin’s and the king’s behavior. They were basically telepathically linked until Yasmin died. Akeylah goes to tell her sisters about this development. Ren is taking a bath. She slips into a hallucination like each of her sisters has had. Hers is of the Talons when they’re attacked and killed at Davenport. It bothers her to see it firsthand like this. When she comes out of the vision, she’s under the water and can’t push to the surface. There’s a voice in Ren’s head. It says it warned her to leave before the feast. It says it should’ve let her die a slow death like these soldiers, the kind of death an imposter like her deserves. Then it says, “It’s time for me to take your place.” Ren’s body goes cold and feels heavy. She decides she deserves to die like the men she killed. She hears the voice say, “It’s time for the true heir to rise.” Then everything fades to black. There you go! That’s what happened in Rule, the first book in the Rule series! Ready to order Rule or Rise, book 2 in this series? Click to buy and help us pay for hosting! Oh and share this with your friends who might like to read a recap of Rule.